I wasn’t really intending to do this as a post, but since my goal is to post every other weekday and I have nothing else ready (why did I begin during the month of December? ), I figured might as well. 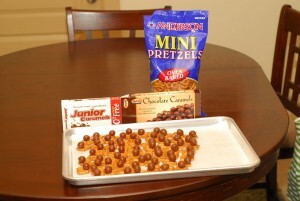 I was planning on making these pretzel treats that I saw my friend making a few years back. For her creations, she used those little square pretzels you can buy and the candy cane striped Hershey Kisses you can only get at Christmas (Hugs work too)…she popped a little m&m into the center of the semi-melted kisses and they turned out so pretty and delicious- looking. But then, I came across this fantastic creation from a great food blog called Our Best Bites and decided to do their version……with my own Dollar Store twist of course. 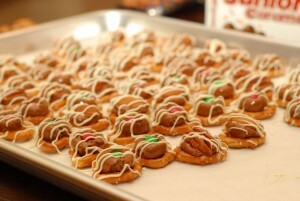 The pretzels and caramels came from Dollar Store and the rest (nuts, m&ms, white chocolate chips) I had on hand. I also purchased a Christmas tin (they have so many fun ones right now) from the Dollar Store to package them up pretty. We delivered them to our mystery family as one of our 12 days of Christmas gifts tonight Of course, I snuck a few before they shipped out and mmmm are they dee-lish. I’ve seen this done with semi-melted Rolos and a pecan on top, too. Not sure if that’s how you did it, but they were delicious also!